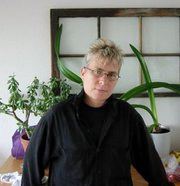 I am Lisa Dettmer and I co-produce KPFA radio’s only feminist show Women’s Magazine which I started with 3 other woman in 2006. I have been at KPFA for over 10 years and producing radio for most of that time after I graduated the apprenticeship program in 2005. I also have over 30 years of activist experience working in the field of police abuse and tenant eviction defense, as well as LGBT and feminist issues. I would like to see KPFA be the community radio station it was meant to be. One where there is actual respect and cooperation between the staff and the listeners so that we are living the mission of democracy that we preach. And I would like to see KPFA expand it’s audience which is absolutely necessary if we are to survive by hiring a development/marketing director who will expand our audience and bring in some much needed grants for invaluable programs like the Apprenticeship program. I want to see a management that is truly interested in involving all the staff in the station and who treat all staff equally. And, provide a council where staff and listeners can communicate. This entry was posted in Analysis by webweaver2. Bookmark the permalink.